THE new head coach of Henley Hawks is targeting a top five finish this season. Luke Allen will take charge of the side for the first time tomorrow (Saturday) away at Bury St Edmunds in National League 2 South. Davies, who ended his eight-year coaching association with the club in May. Allen, the club’s former forwards coach, joined Henley as a player in 2013 from Cinderford where he had a successful playing career for three seasons. But he suffered a serious neck injury in pre-season preparation which limited his Hawks appearances to eight games. Since coming in, 30-year-old Allen has boosted the club’s playing staff and says he wants to make the side hard to beat. He said: “It’s been brilliant, we’ve had 40 or 50 players training twice a week. There are a lot more players this year with strong links with the RAF and a couple of lads from Chinnor — Rory Mason and Alex Bradley. I want Henley to be physical and intimidating but play with the flair that Pete wanted. Allen says he was ready to quit the sport after his injury before Davies offered him a coaching role. He said: “I started my coaching career when I was 25. I was ready to walk away from the game after my injury but I’ve not looked back since. Allen will be assisted by Tom Gardner, a senior coach for the RAF winners of the Inter Services tournament this year, and long-serving Henley Bulls coach Andy Jones. He says they have concentrated on improving the club’s infrastructure, with more focus on a stronger second team to provide competition to the first team. Allen said: “We’ve been honest and set down what we want to do. I want us to go back to the grassroots. “Pete had some fantastic systems but we’ve gone back to the club to say we need support from the bottom to the top. You can’t have a successful first team without people in the second team to push them. 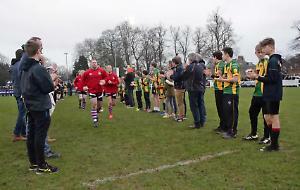 Nigel Dudding, director of rugby at the club, said: “Luke’s been one of our senior coaches at the club for the last three years. “He knows all the systems and has proven himself to be a good coach. He has all the qualities we are looking for. He’s also an ex-Hawk and we are trying to keep everything in house with people who understand Henley Rugby Club and what it’s about. Bury St Edmunds finished one place and four points above Henley last season, although they were beaten by the Hawks twice. Allen has selected five players to make their debuts including Sam Lunnon, a summer signing from Old Albanians who will also captain the side. New prop Mason joins Brad Cook and Tom Emery in the front row. Young scrum half Leo Webb also starts with regular Joe Butler at half back while winger George Wood and full back Sam Randle will also make their debut in the backs. Allen said: “I’m really excited for the boys to show what they’ve got. The mood in the camp is good so I’m hoping we can keep the error count low and capitalise on a strong defence.